A delegation of the Moldovan Education and Youth Ministry headed by its Deputy Minister Valentine Krudu is expected to pay a visit to Azerbaijan on October 26-29, a source in the Moldovan Embassy to Azerbaijan told Trend today. The main aim of the visit is to participate at the Moldovan Youth Days to be held in Azerbaijan these days. 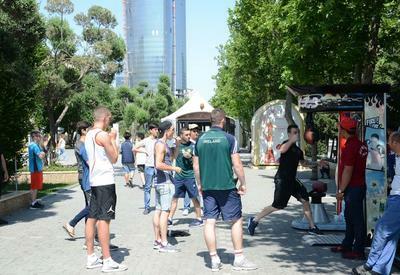 The program of the forthcoming visit has been worked out by the Azerbaijan Youth and Sports Ministry. The Moldovan delegation is expected to visit the Honorary Burial Place and the Martyrs Alley, lay wreathes on the grave of Azerbaijani Ex-President Heydar Aliyev and the Memorial Complex on October 26. Then they will meet Azad Rahimov, Azerbaijan`s Youth and Sports Minister. On October 27, the Moldovan delegation is expected to visit the Baku Slavic University. On October 28, a concert of Moldovan artists will be held in the State Philharmonic Society on October 28. On October 29, the delegation is expected to visit Sumgayit. According to the Moldovan Embassy, during the visit to Azerbaijan, the delegation will discuss perspectives of further development with Azerbaijan.